There is a universal principle of childhood physics that we all remember well: the joy of spinning in circles. Perhaps it was spinning while locking hands with a playmate, in a teacup at Disney World, dancing in pirouettes, or simply turning in place – it was a thrill to send our surroundings into a kaleidoscopic blur. This was followed by a dizzy fit of giggles – at least until our internal compasses caught up, and the world came back into focus. Do you remember? Four years ago, a little girl named Jaka was spinning around in circles with some other children while her mother was at the market. Around and around, arms out, chin up, her face full of smiles. Tragically, when Jaka lost her balance, she plummeted into her aunt’s cooking fire. 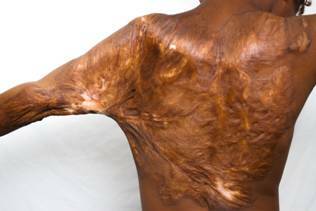 Jaka landed in the burning coals on her left side with her arm up. The pot of boiling water her aunt had prepared for rice spilled over the little girl’s shoulders, arms and back. 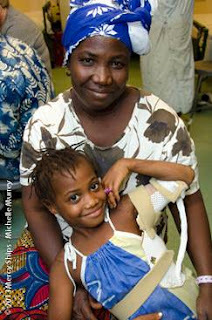 Fanta, Jaka’s mother, ran home from the market and took her daughter to a local hospital in Conakry. 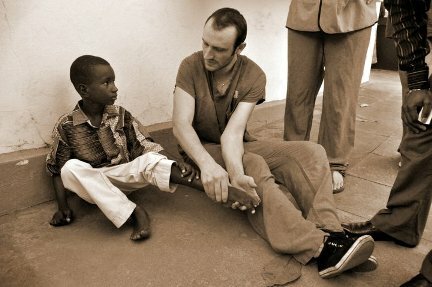 In order to be seen by doctors, the hospital required a payment of 1.5 million Guinea Francs at the gate – just over $200. The family could not afford admission. Fanta returned home with Jaka, unable to ease her daughter’s agony. 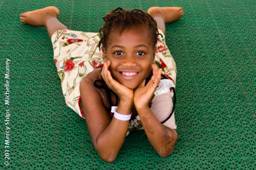 For the next eight months, Jaka laid on her little stomach, tethered to the ground by unimaginable pain. Each day, her mother fanned her, trying to offer Jaka whatever relief she could from the inescapable African heat. As Jaka’s burns healed without medical care or rehabilitation, her left shoulder and arm contracted. 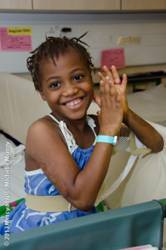 Jaka’s skin began to grow back in such a way that her arm became stuck to her side from her armpit to elbow. Fanta feared that Jaka would lose the ability to move her arm. 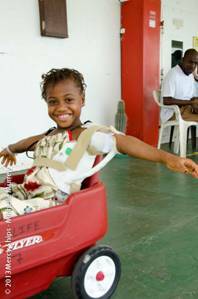 Still unable to afford any medical treatment, Fanta tried to treat the problem herself. Fanta forced Jaka’s arm away from her side three times, trying to prevent the contracture. Fanta described each attempt, saying that she and Jaka both cried themselves to exhaustion. On the fourth try, Jaka begged her mother to stop because the pain was so unbearable. “If you try to pull it open again, I will die. The pain will kill me,” Jaka said to her mother. With that, Fanta resigned herself to allowing Jaka’s arm to heal on its own, stuck to her side. 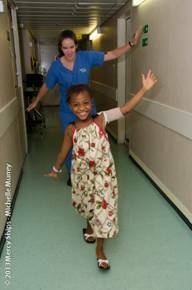 Today, 9-year-old Jaka is a patient on the Africa Mercy hospital ship, recovering from a free plastic surgery that released her arm and grafted skin. Deep burn marks cover her entire upper body – her head, neck, shoulders, back and arms – but no one notices because they are entranced by the little girl’s adorable gap-toothed smile. 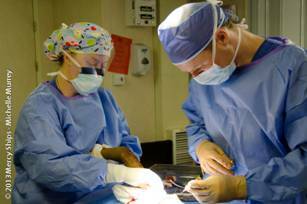 Dr. Guido Kohler (Germany) and OR Nurse Allison Green (Texas) operate to release Jaka’s burn contracture. Sweeping, washing and fighting – these are the activities Jaka says she will get to do with her restored arm. Laundry might not be appealing to many, but participating in household chores is a normalcy Jaka has never known. “I am so happy,” Jaka says. “When I go home, I will work all the time because I can.” (Fanta admits she is glad for this enthusiasm.) 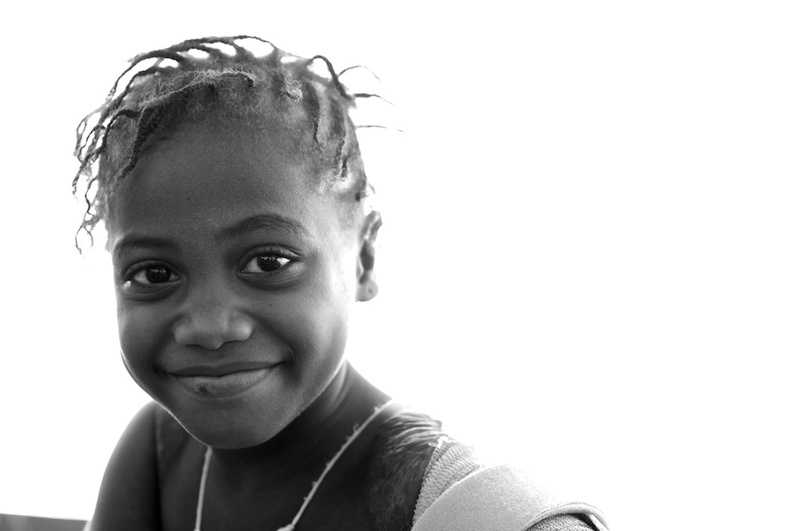 Free of her deformity, Jaka will also now be able to go to school for the first time. As for fighting, Jaka is one of ten children, and she happens to be very ticklish. With her new arm, she will be able to hold her own the next time she is picked on by one of her older brothers or sisters. She was ashamed to go among her siblings and friends when her arm was stuck to her side because they would tease her. “Now they will see me and say, ‘Jaka has become well!’” she declares. Then they will invite her to sit with them and watch the cars go by their house. 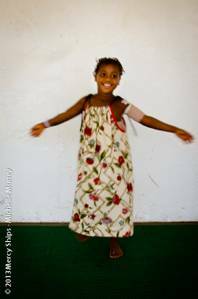 From her hospital bed, Jaka is all giggles – she can hardly contain her excitement for her now-bright future of playing, going to school and watching cars. But Jaka’s favorite part about her restorative surgery and rehabilitation is even simpler than that: “Clapping!” she exclaims. With her arm free, Jaka can finally clap with both hands. Now there’s a happy ending worthy of applause. Jaka really does have a joy and whenever she comes down to the tent the whole atmosphere changes. Her smile and laughter make all the hard work worth it. Jaka really has reminded me to always be thankful for the small things.